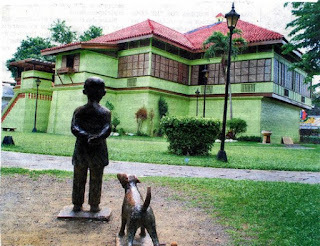 Home » History » Philippines » Pinoy brain » Pinoy Trivia » What is the name of the dog of Dr. Joze Rizal? » What is the name of the dog of Dr. Joze Rizal? What is the name of the dog of Dr. Joze Rizal? When Rizal fell down, the dog in the picture ran around Rizal’s body. It may be a playful bloodhound as the soldiers were rejoicing to the “La Marcha de Cadiz.” The Spaniards took this as a bad omen for the uprising; they were afraid as it might be the sign of a black cat. The cry for “Viva la Espania” would be short-lived. Historians have no clue as to why there was a dog present or its significance. We have been fascinated by Rizal's allegorical storytelling, and I could not express a deeper meaning with justice to the poetic hero’s artistic ways. As a young lad in Calamba, Rizal had a dog. You can see the statue of Jose and his dog in the family shrine.